Kel: Hi again. So, where were we? Rawene. We left there the following morning to the start of probably the most driving we've done in a day so far. We headed down the west coast of the north island toward the Waipoua Forest, home to the amazing Kauri trees. NZ has been a true test of our driving. Loads of really steep and really curvy roads up and down hills. We both had to stop at first and get out ... high chuckability factor. We first visited the most amazing tree I've ever seen. Tane Mahuta - god of the forest. 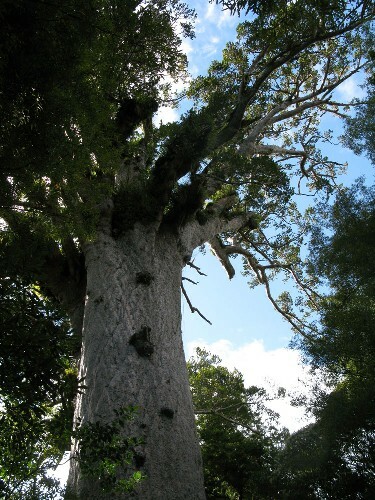 It's the largest living kauri and is over 2000 years old (I think?) and basically looks like the beanstalk in jack and the beanstalk. Absolutely mesmorising. We headed on to the fantastic kauri museum further south and learned about the timber industry and a bit more about the life of European settlers from about 1860s through to 1960s. We both found it really interesting, and it especially made me appreciate what my grandpa's life would have been like working in forestry in Canada and in the Highlands. We ended the day with the most mammoth drive past Auckland and over and up to the Coromandel province for the next couple of nights, via a visit to a honey centre. We did get manuka honey Mum! (although I preferred clover) and even got to see the queen bee working away which was pretty cool! We had another spectacular drive up the east coast of the Coromandel coast toward Coromandel Town (an area where the city folks from Auckland tend to have their holiday homes) which Matthew still says is one of his best bits. Just absolutely stunning views around every corner. Just wait til you see the photos!